After completing Canada's Lotus Flower Tower, Maureen Beck and Jim Ewing are planning their next big climb. Chris Whalley still can recall his 2-year-old daughter hanging off the back of their couch in Ellsworth with one hand. Born with only her right hand, Maureen Beck was fearless from an early age and hasn’t slowed. Now one of the foremost adaptive female rock climbers in the world, Beck, 32, is still breaking boundaries. 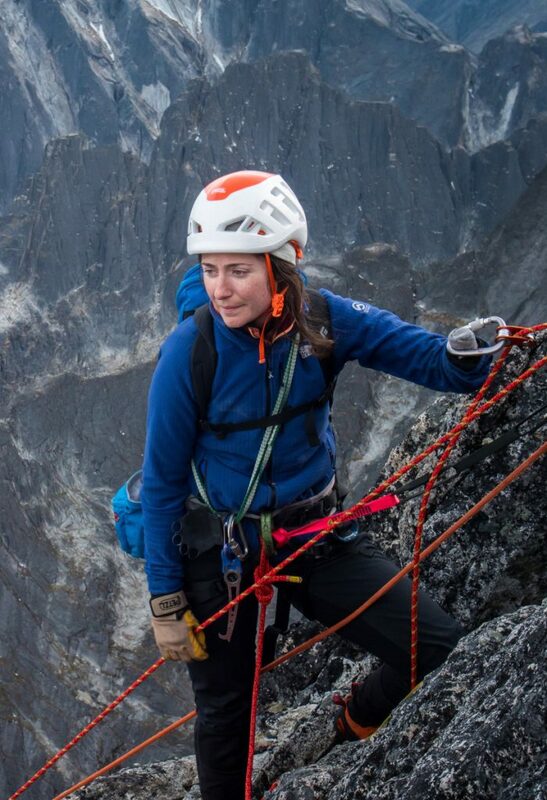 In August, she joined adaptive climber Jim Ewing of Falmouth to attempt an unassisted adaptive climb of the 2,200-foot Lotus Flower Tower in the Northwest Territories of Canada. It was a climb that required weeks of travel into a remote wilderness and an ascent of the imposing granite tower. From the beginning it was intended to prove people with disabilities can be some of the best athletes in the world. Beck was born without her left hand and Ewing, 54, a climber of 40 years, lost his left leg after a climbing accident in 2015. After his ankle shattered from a 50-foot fall in the Cayman Islands, Ewing considered whether to live with an ankle so weak he couldn’t walk without pain. He chose to have it amputated. Just a few years after learning to climb with his prosthetic foot, Ewing wanted to tackle a big, remote climb. He already had climbed in New Zealand, Australia and across Europe, Canada and the U.S., but never attempted the Lotus Flower Tower. He decided to make the ascent with another adaptive climber. Through Paradox Sports, which teaches adaptive climbing, Ewing was introduced to Beck, a five-time national paraclimber and a two-time world champion. Ewing knew instantly they would make a dynamic team. They shared a sense of humor, a love of the outdoors and a passion for proving people wrong. Beck started climbing at age 12, became consumed with while attending the University of Vermont and never stopped. In 2012 she and her husband, Brian, moved to Denver, largely so she could climb more. Beck turned pro a year ago after receiving sponsorship. She currently is helping USA Climbing grow its adaptive team. Emmett Cookson, a coach at USA Climbing, said adaptive climbers have made Alpine climbs in remote areas before. But what is unique about Ewing and Beck’s ascent of the Lotus Flower was that it was one of the first times such a team had a film production crew following them. A short documentary about Beck, titled “Stumped,” was shown at the Banff Film Festival and the Vancouver International Mountain Film Festival earlier this year. The cost of the $20,000 Lotus Flower Tower ascent was funded by Sterling Rope Co. of Biddeford, where Ewing works as an engineer. “The hope with any kind of exposure like Mo’s films is people will realize adaptive climbers have been pushing the limits of the sport just like able-bodied climbers and for current adaptive climbers to see what’s possible,” Cookson said. The Lotus Flower Tower, a granite spire that sticks out amidst a vast wilderness of boulders, is miles from any village. Getting there required a float plane, a helicopter and a 2-mile hike. Beck and Ewing spent two weeks in the outback to climb for two days. Beck and Ewing completed the 2,200-foot climb – but not unassisted. On the second day, after a night spent sleeping in a cave on the monolith’s rock face, Ewing got violently sick. After completing 14 pitches they finished the last four using ropes set by the two-person film crew. It was disappointing, but their partnership was cemented. This weekend they are climbing together in New Hampshire, ready for the next adventure.